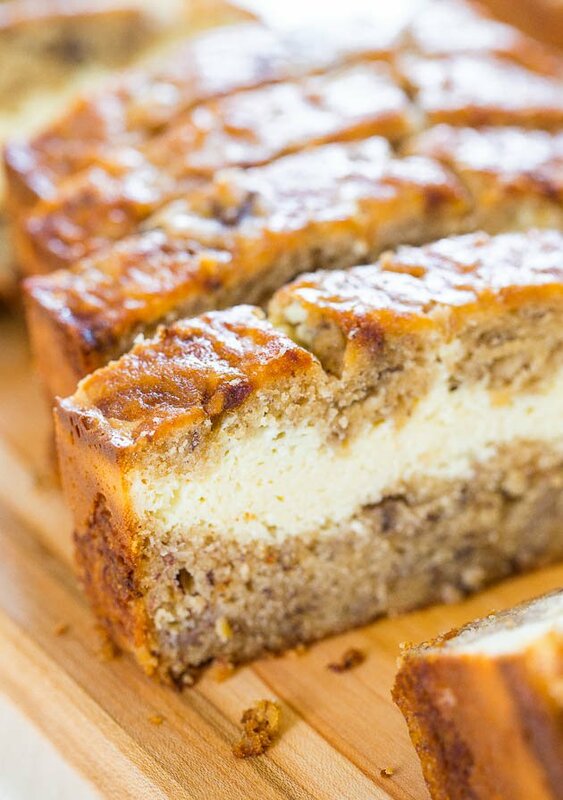 Cream Cheese-Filled Banana Bread – Banana bread that’s like having cheesecake baked in! Soft, fluffy, easy and tastes ahhhh-mazing!! With over 40+ banana Bread and banana recipes I don’t know why I’ve never incorporated cream cheese. I don’t know what I was thinking because I was really missing out. 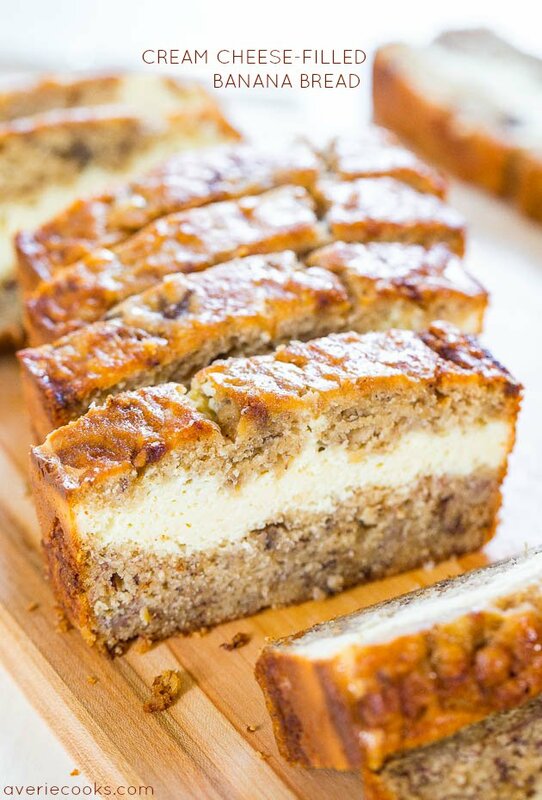 The bread is soft, moist and the cream cheese layer is like having a layer of cheesecake baked into banana bread. No complaints here. I had ripe bananas and cream cheese getting ready to expire and knew I needed to do something with both. And voila, this bread was born. 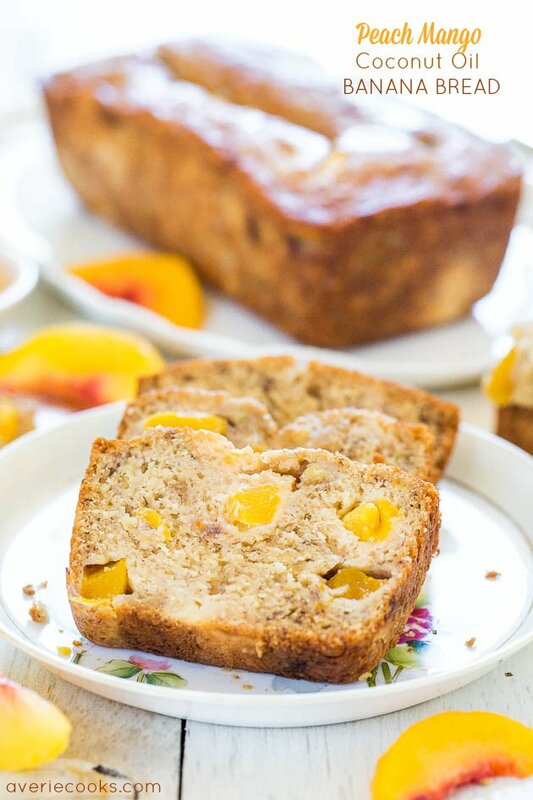 I essentially halved this Peach Mango Coconut Oil Banana Bread. I love everything about that recipe except it makes two loaves and I knew one loaf of cream cheese-filled banana bread would be plenty. It’s almost swimsuit season. The big river of cream cheese reminds me of the cream cheese in Blueberry and Cream Cheese Muffin Top Bread but this is a thick, bold, unmistakeable layer. It really makes this bread out of this world. It’s an easy, no mixer recipe that goes from bowl to oven in minutes. I use melted coconut oil so there’s no butter to cream and no mixer to dirty. Oil keeps bread softer and springier than butter, and I prefer the taste. Coconut oil adds a nearly imperceptible undertone that’s sweeter and more fragrant than canola or vegetable oil, but substitute with them if you’d like or if you’re very sensitive to coconut flavors. 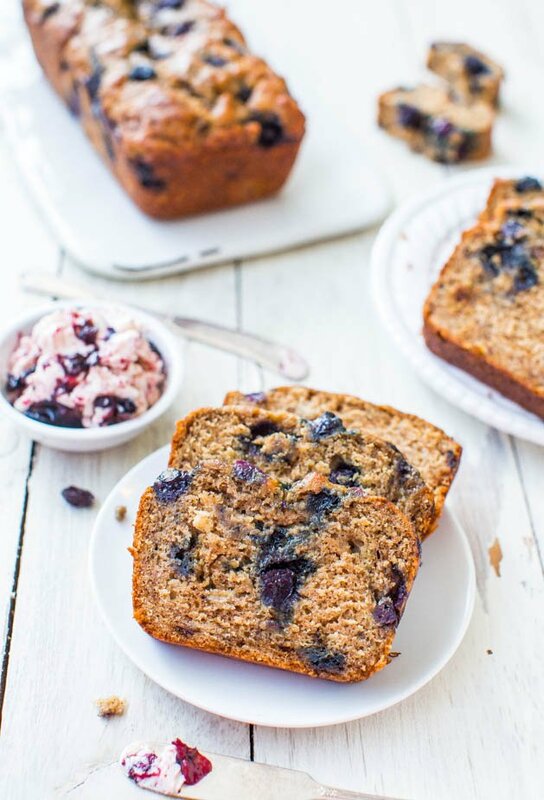 I love baking with coconut oil for muffins, cakes, bread, cookies and more. A little sour cream (or Greek yogurt) is extra insurance for a soft, springy, bouncy, fluffy loaf. Using sour cream, Greek yogurt, or buttermilk in quickbread and muffin recipes ensures more tender results. I had intentions of making French toast with extra slices from the loaf, but we loved this bread a little too much and it disappeared in a day. It has been a reader favorite that went viral in 2014 when I first posted this recipe. The recipe and photos have been stolen and copied, but that goes with the territory with viral recipes. Most importantly, it’s been adored by thousands of people and those are the comments and feedback I love reading. Here’s a video demonstrating how I make the Cream Cheese-Filled Banana Bread. 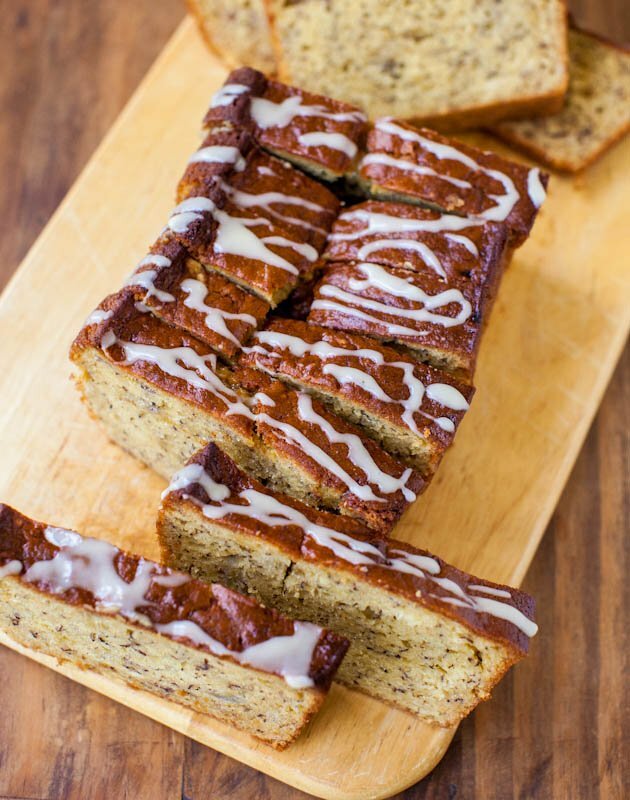 Banana Bread with Vanilla Browned Butter Glaze – Classic banana bread when you have 2-3 bananas. Vanilla is used four times in this easy recipe that turns out moist and perfect every time! 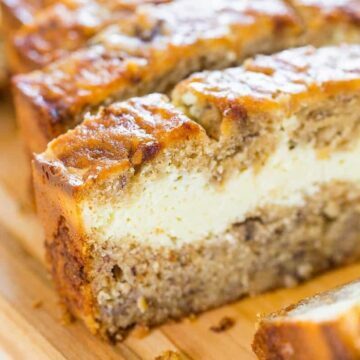 The bread is soft, moist and the cream cheese layer is like having a layer of cheesecake baked into banana bread. It’s an easy, no mixer recipe that goes from bowl to oven in minutes. I use melted coconut oil so there’s no mixer to dirty and oil keeps bread softer and springier than butter. Coconut oil adds a nearly imperceptible undertone that’s sweeter and more fragrant than canola or vegetable oil, but substitute if desired. Sour cream (or Greek yogurt) is extra insurance for a soft, springy, bouncy, fluffy loaf. The big river of cream cheese is thick, bold, unmistakeable, and really makes this bread out of this world. Bread – In a large bowl, add the egg, sugars, coconut oil, sour cream, vanilla, and whisk to combine. Add the bananas and stir to incorporate. Add 1 cup flour, baking powder, baking soda, optional salt, and fold with spatula or stir gently with a spoon until just combined; don’t overmix; set aside. Evenly pour filling mixture over the bread, smoothing the top lightly with a spatula and pushing it into corners and sides as necessary. Top with remaining batter, smoothing the top very lightly with a spatula as to not disturb cream cheese layer and pushing batter into corners and sides as necessary. Bake for about 48 to 50 minutes or until the top is domed, golden, and the center is set, and a toothpick inserted in the center comes out clean, or with a few moist crumbs, but no batter. Note this is tricky because the cream cheese never gets totally solid so the toothpick test isn’t the most accurate. Tip – Tent the pan with a sheet of foil draped over it at the 30 minute-mark if you feel the tops and sides will become too browned before center cooks through. Baking times will vary based on moisture content of bananas, cream cheese, climate, and oven variances. Bake until done; watch your bread, not the clock. Allow bread to cool in pan for about 15 minutes before turning out on a wire rack to cool completely before slicing and serving. 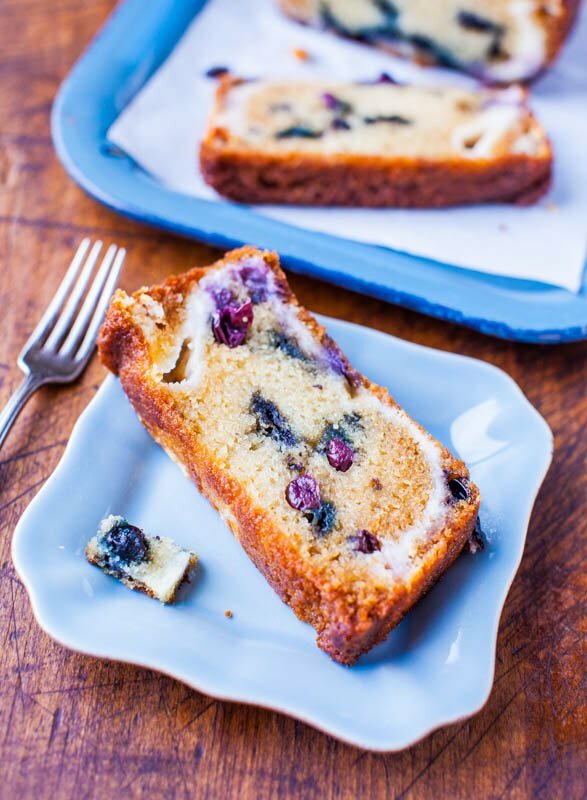 Optionally, serve bread with Honey Butter, Cinnamon-Sugar Butter, Blueberry Butter, Strawberry Butter, or Vanilla Browned Butter Glaze. Bread will keep airtight at room temperature for up to 1 week, or in the freezer for up to 6 months. I made this today. It was delicious!!! Is it really 1100+ calories per serving???? That seems a lot even with the cream cheese filling…. No I’m sure there is a glitch that the software doesn’t know how to calculate one loaf from one piece. Can I use the solid coconut oil and then melt it or do I need to use the coconut oil that’s already liquified? Get the coconut oil in a liquid state, however you wish to accomplish that, and then measure it out from there. Help! I just put these in the oven and even the batter smells amazing! But I didn’t save enough to fully cover the top its a loose mix of the cream cheese mixture and the banana bread mixture. Will it still turn out okay just not as ascetically pleasing? Yes to your last sentence but I’m sure the taste is fine. The nutrition info lists 188 g carbs per serving. How is that even possible–Is the info listed for the entire bread? Yes that’s the whole loaf. Divide it by the number of slices you yield. I’m so glad I came across this recipe. Shared 1 loaf with my neighbor…. and I kept getting quite a few thank you messages … guess every time someone ate a slice, my mobile beeped ? Oh my goodness it looks amazing. 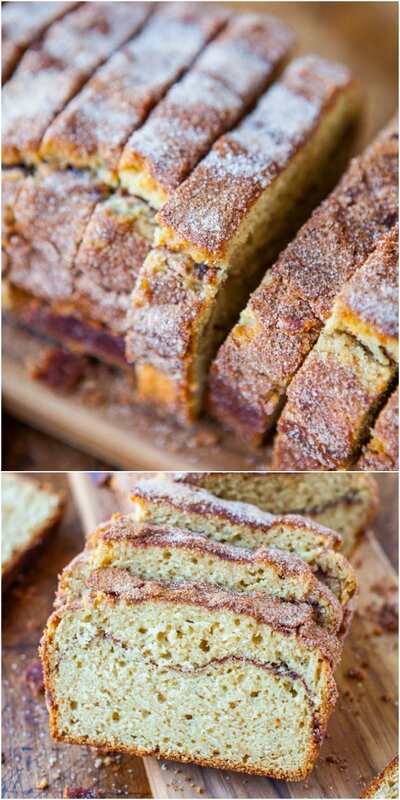 Adding a cinnamon sugar crust is my favorite thing to do with quick bread! 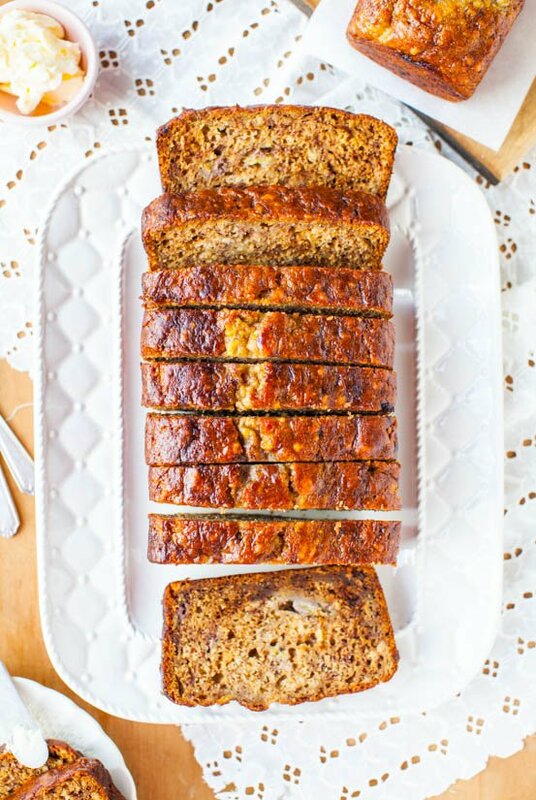 The best banana bread recipe ever! I tried it many, many, many times and have gotten so many compliments and request to bake it more often. Even added choclate and berries to the cream cheese batter for a new twist. Was delicious! Can’t wait to try your other recipes! Thank you! 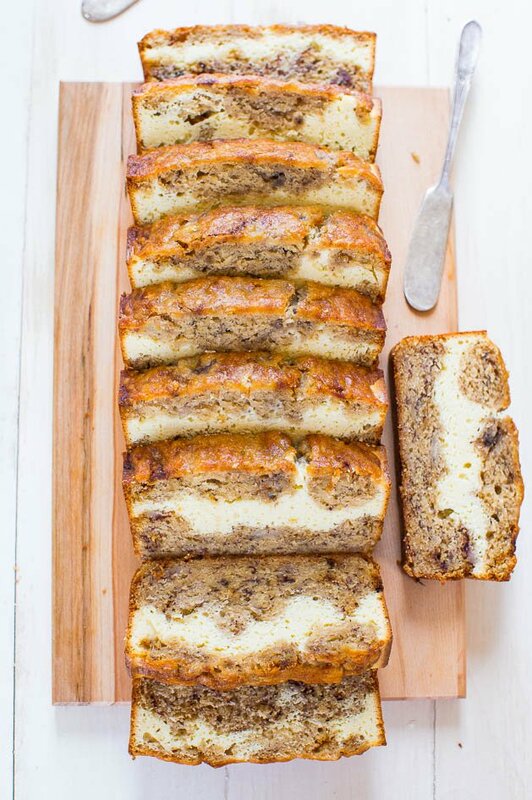 Thanks for LMK that this is the BEST banana bread recipe you’ve ever tried and that you’ve made it a ton of times! Glad it always a hit! The chocolate and berry twist sounds lovely! LMK what else you end up trying of mine. 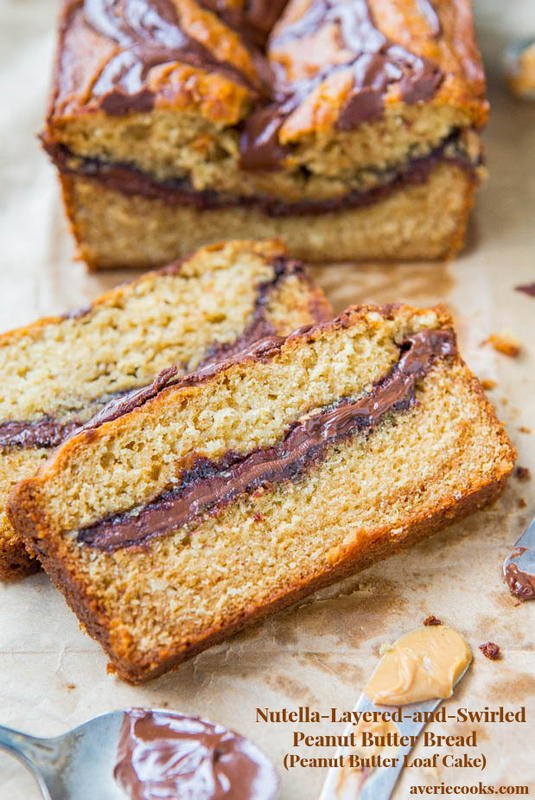 I made YOUR banana bread recipe exactly as you shared it. Thank you so much for sharing. My husband LOVES banana bread and just went on and on about how spectacular your recipe was. Btw, as hard as it was to do I gave you the credit for his new favorite treat. He even said it was better than his mama’s… SHHHH. Please keep sharing, I will be trying many more of your recipes. Yummy yummy!! I’m so glad this was a big hit with your husband and even better than his mom’s. Shhhh ? I couldn’t decide if I wanted to make your cream cheese banana bread or the peach mango banana bread so I combined the recipes!! I followed the instructions for the peach mango and added the cream cheese center and put it all in a 9×5 loaf pan.Served it(to myself) with whipped cream.I need a moment…. OMG that sounds amazing! I can see how that would be killlllller! Good call on following the recipe for the peach-mango-banana and then adding a layer of CC in the middle. I wish I was having that for dinner actually! I just made this…terrific! I made them into muffins and they turned out awesome! I also used melted cold pressed coconut oil and vanilla Greek yogurt, taste GREAT!! I love that you used coconut oil (I love baking with coconut oil, especially banana recipes, something about the two are perfect together!) and glad this came out great as muffins! I love making this banana bread! If I do it as muffins, do you still bake at 350 degrees for 50 min or would it be less? 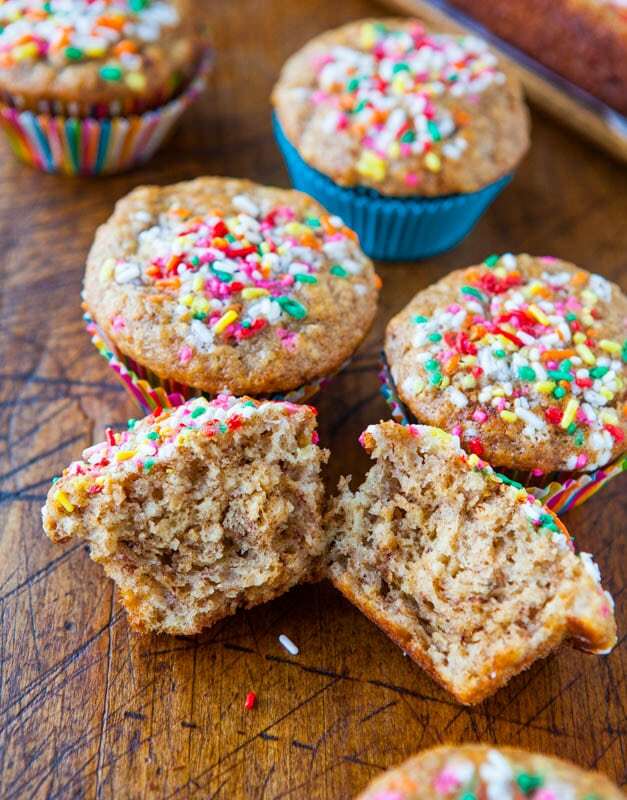 Muffins would definitely require less baking time, probably 20-25 mins, just guessing with this recipe. 350F same. honestly probably the most moist banana bread i have ever tried!!! we loved it so much; it basically melts in your mouth. i followed your recipe exactly, however, my cream cheese layer did not turn out as fluffy and we couldn’t really taste it besides being able to see it. the whole loaf came out of the oven pretty domed and golden, but deflated a little as it cooled. any tips? regardless, ill definitely be making this bread again. who doesn’t love super duper moist bread? ;) thank you so much for sharing this recipe!! Glad you really enjoyed this super moist banana bread! Regarding falling a bit, sometimes that means you undercooked it just a bit, maybe it needed another 5-10 minutes, hard to say. Also King Arthur flour is my preferred flour for baking because it has slightly more gluten to give things more structure, i.e. insurance against deflation. I made this last night using King Arthur’s gluten-free flour! It was my only substitution and it turned out amazing!! This 7 months pregnant mama is one happy lady. Thanks for LMK that the KAF GF flour worked great! That is great news and I will share it with others! I don’t have cream cheese but I have cream cheese frosting. Do you think it’d be good with that in the center?!? No it will melt into a literally hot mess. I recommend using actual cream cheese. Hi Averie, thank you for this recipe, the cream cheese layer is magical! I just thought I”d let you know that there’s a Buzzfeed post with your recipe on it that doesn’t credit you. The photos aren’t yours, but the recipe is. Just letting you know in case you want to get them to take it down! Thanks for the heads up and for taking the time to write! They tend to do this thing quite often which is so frustrating. Glad you love this bread! Hi Averie! Can this be made into a muffin? Yes I’m sure it can but I haven’t personally tried it. I do not have a 9×5 pan, can a 8×4 pan be used? If so do I have to cook it for less time? say 35-40 mins? I think this loaf will be too large for an 8×4 but you can try. Likely you will need to cook for a bit more time but I am just guessing. 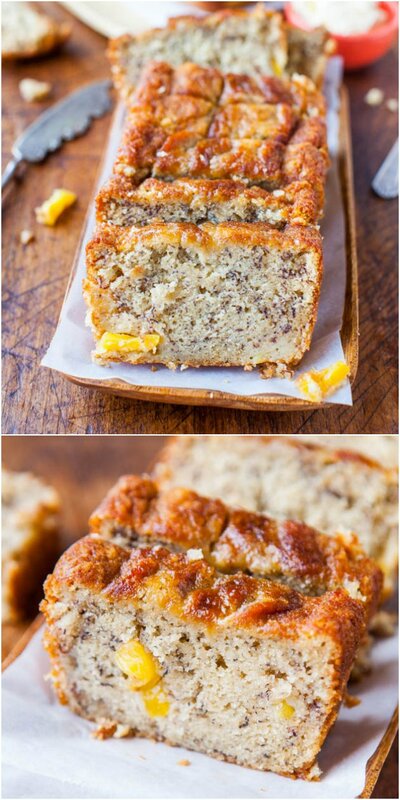 Awesome recipe for cream cheese filled banana bread found on Pinterest. Thanks for the 5 star rating and glad you loved it! This recipe was amazing! Super easy to make, using normal ingredients that a typical pantry would have, and clear, useful instructions. My kitchen wasn’t a disaster from using 19 different bowls/tools to make this! Best banana bread I have ever made! I have even printed this recipe out and put it in my recipe album. Thank-you so much sharing this! Glad it was a major success and thanks for the 5 star review! And I try to keep the amount of tools, bowls, etc. one needs to a bare minimum in my recipes. Glad you appreciated that fact! I make banana bread often but had never tried it with cream cheese. It was delicious and easy. And it baked well even after I put most of the batter on the bottom and couldn’t cover all of the cream cheese layer. Thanks for the recipe! 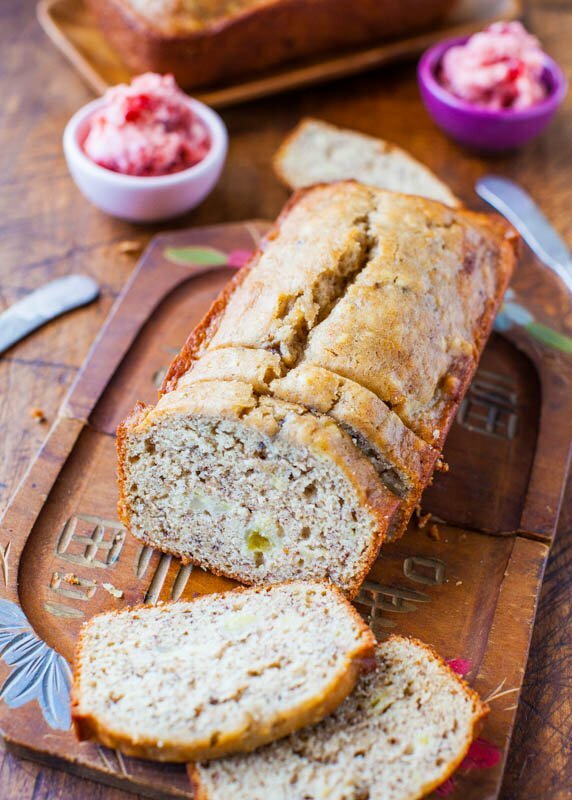 Thanks for the 5 star review and glad you love this twist on banana bread! This recipe is one of the best I have made. I didn’t have brown sugar so I added 2 TBS of molasses to granulated sugar. The bread came out darker but beautiful and very moist. I didn’t have enough batter to cover the cream cheese mixture so it came out marbled. It didn’t matter. I made strawberry butter with macerated strawberries and unsalted butter. I blended with a hand mixer. I took this to a house warming and it was a big hit. I will add this to my favorite recipe list. Thanks for LMK it is one of the best you have made! The strawberry butter sounds lovely with it. Thanks for the 5 star review! The strawberry butter idea was yours in your suggestions. I macerated fresh strawberries, drained off the liquid and just blended with butter with a hand blender. It turned out perfect. I should have taken a photo of it. It all was so pretty and the ladies requested your recipe. Said they do a lot bake fundraisers and this would be a great recipe for that. I have forwarded it on. Thank you so much for providing the delicious recipes. Looking forward to trying more! Sometimes I even forget what I suggest, so many recipes…lol. Glad it came out great and that you will be trying more recipes! 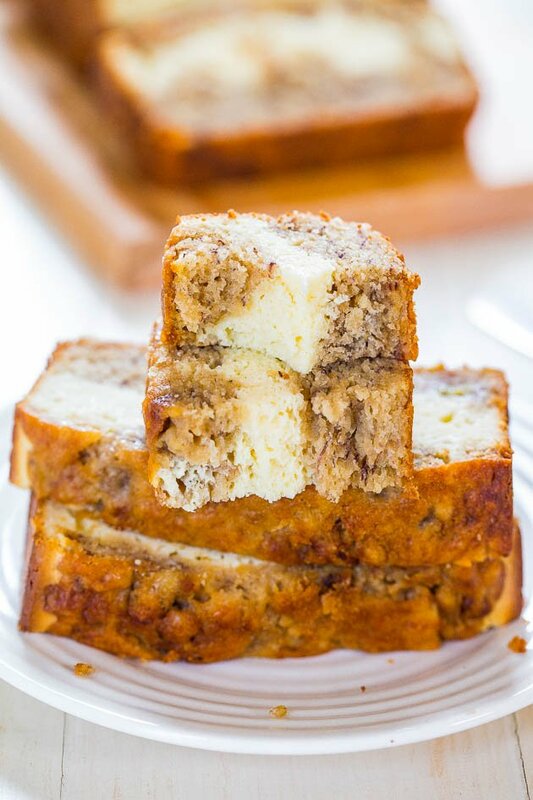 Amazing banana bread recipe, I made it exactly as you showed but added walnuts and the mixed flavors of the cream cheese, banana and walnuts was out of this world. Thank you Averie!! Thanks for the 5 star review and glad you loved this bread! Made it today in tropical Singapore. I baked it @ 180 degrees celsius for 30 min and left to stand in oven for another 10 min (off heat).It made only one loaf and a tiny one. So good. I loved this recipe! Easy to make and tastes wonderful. I used 2 eggs instead of one large because I can never find them. They say large but they’re not. I also used 3 bananas. It cooked for about 50 minutes and it’s perfect. Thank you!